Scion AV has posted up an overview of the design objects and products we created for “Long Play,” our show at their pop-up shop/retail space on Melrose Avenue in Los Angeles. We had the chance to work on a scale we’d only dreamed of before, crafting the steel side-tables above as well as an array of other products, including clocks, skateboards, and pillows. Visitors to 7667 Melrose Ave will have the chance to page through all our Draw Down publications as well, all priced to sell. Plus there are free goodies– a typographic poster and an exhibition catalog! Hit the space up through April 17! Our upcoming show at Scion AV Installation is going to open this Saturday in Los Angeles. Check out the trailer! RSVP for the opening here. The show will be up between March 16 – April 13, 2013. Hey! 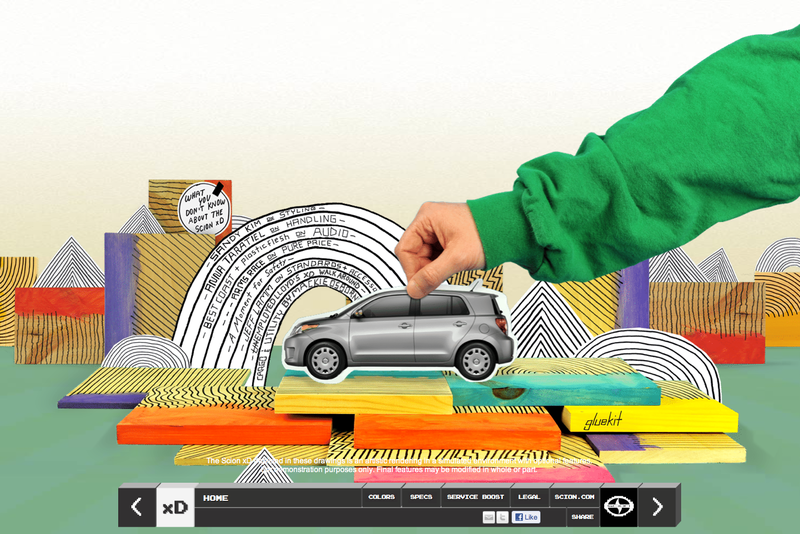 The layout we did for Scion’s xD Interactive Brochure is now up and live! Features a bunch of awesome stuff from other folks who’ve been involved with Scion A/V. They are the best at getting awesome artists and musicians to do cool stuff, and this brochure showcases Anna Taratiel, Best Coast, Plastic Flesh, among others. With thanks to our friends at Project No. 8! Just got in some amazing images of our art car for Scion! Last week we were in New York for the 10th Anniversary celebration of Scion’s commitment to music, art, and design, which included an exhibition of all the Scion iQ art cars. It was amazing to see our car in real life– and we loved seeing what the other artists (including David Choe, Cody Hudson, French, Dust La Rock, and the Melvins) did with theirs. Super fab to see old friends and meet some new ones as well. We’re so grateful to Scion for giving us the opportunity to do a car like this! The Scion iQ looks like a little gem. 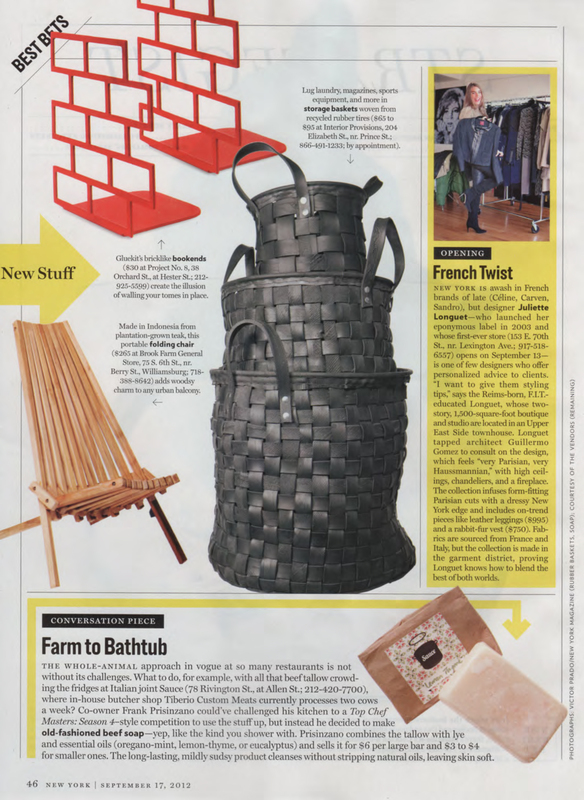 Our brick bookends were featured in this post on Style Carrot! Following up on yesterday’s painted bookshelves post, it seemed like a good time to run this. When I put this together a few weeks ago, I had just spent the weekend clearing off our living room bookshelves. Not clearing them of books, but the way too many paintings that are stacked three deep, and vases, and magazines that need filing, and the Swedish Lily candlesticks I keep buying on eBay, and so on. I don’t really need bookends, since I have so many books they go from one end to the next, but I’m often tempted by them design-wise. 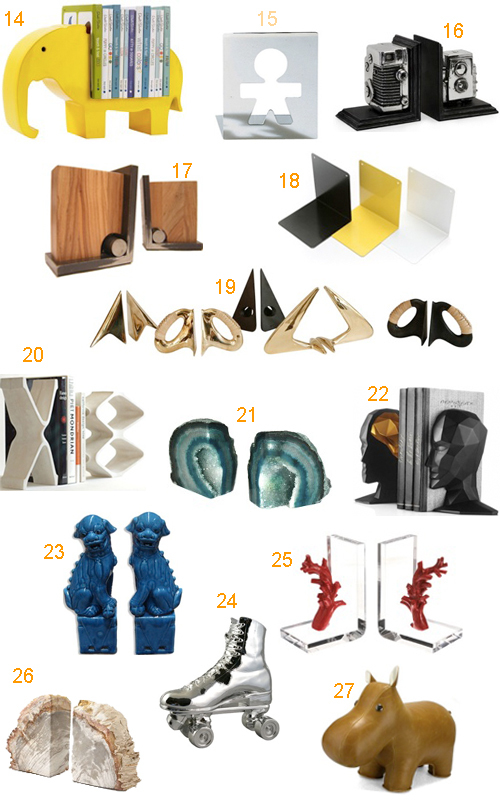 Here’s an array of bookends both functional and beautiful. 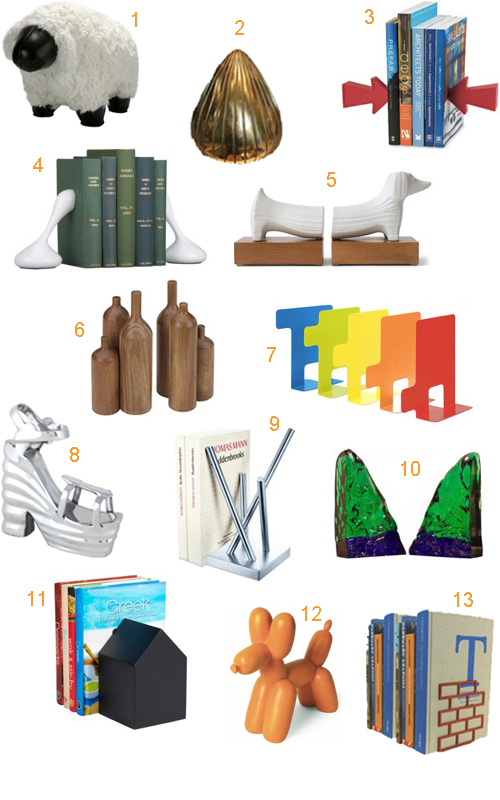 1 Sheep Bookend by Zuny, $56 each at Emmo Home. 2 Vintage Jenfred-Ware Brass Bookend by Ben Seibel, $125 at Unica Home. 3 Red Signal Magnetic Bookends, $28 at Chiasso. Gluekit’s Stacked Bricks Bookend Sets are now available at the the Gap + Cool Hunting Holiday Popup Store in New York City this holiday season! The pop-up has some truly beautiful locally-sourced items, all curated by the stylish folks at Cool Hunting. 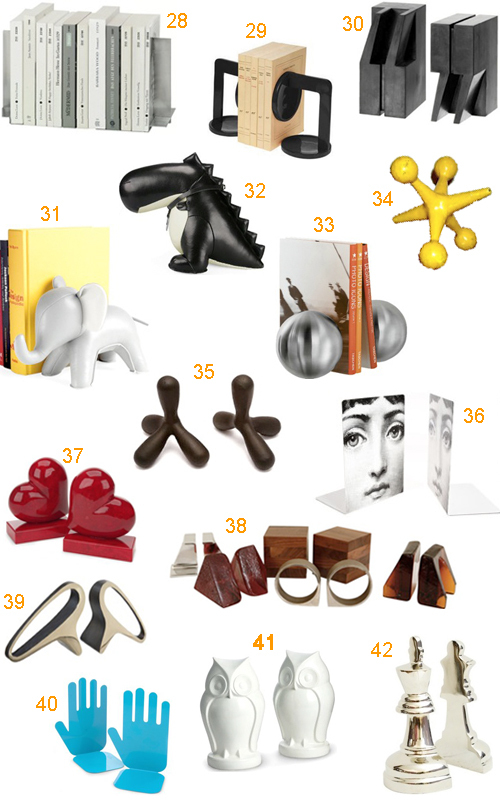 Gluekit’s Brick Bookends are now available at Third Drawer Down and The Museum of Art Souvenirs Store in Australia. 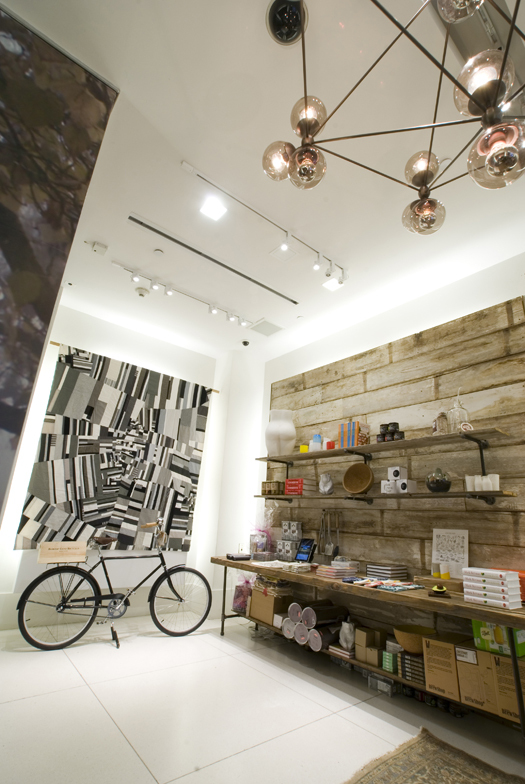 From their website: Assembling a curated array of art and designer products, the store functions as both showroom, design studio, museum and retail space with objects either hand picked from various popular cultural contexts or made by Third Drawer Down for leading Museums around the world. The Museum of Art Souvenirs Store is nestled behind a graffiti tagged garage door and is Australia’s only trading museum. It’s like visiting all the best museum stores in one spot, and shipped everywhere (even to the moon). Our eccentric and witty taste of products by artists/designers and niche brands include crayon rocks, chocolate pie charts, giant corn cob stools, children’s art supplies, limited edition textiles, bed linens and publications that question the mainstream conditions under which art and culture are bought and sold. Lots of cool stuff to check out when you visit! 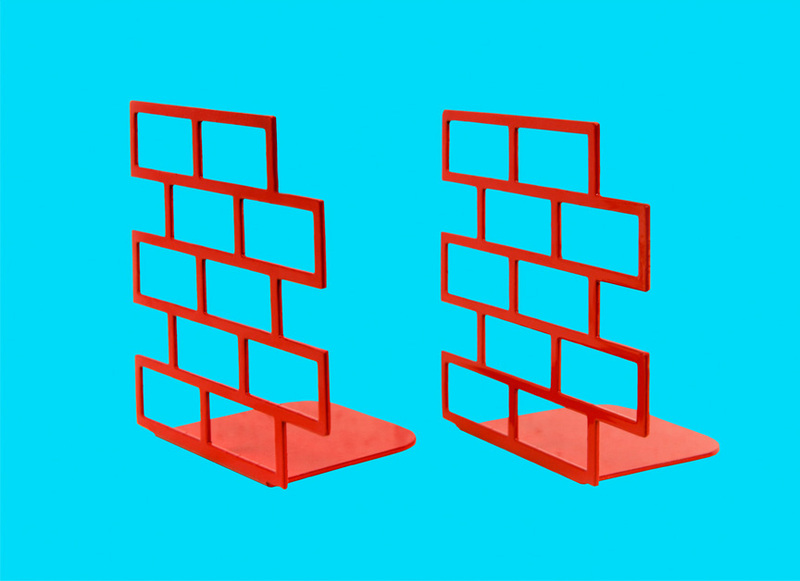 Gluekit has made some “Stacked Bricks” bookends available in powder coated red steel. Get them now at Park Life in San Francisco! Back in September, we were thrilled to be asked to participate in a giant yellow sticky project by the kind folks of Elsewhere. 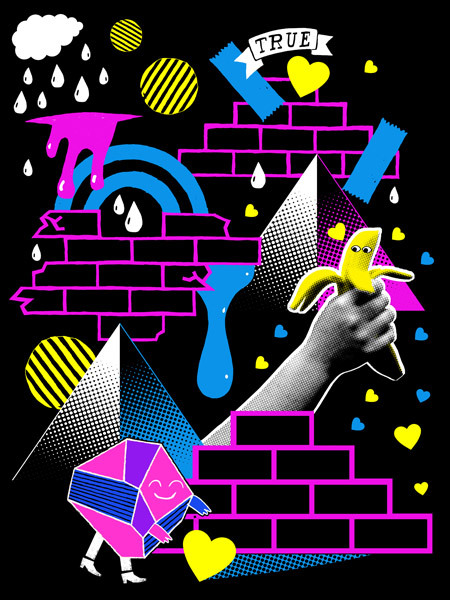 Their project was a collaborative poster campaign that used the motif of stickies, created by various graphic designers and studios, to paste up design across London during the 2008 London Design Festival. The limited edition and in many cases completely unique posters were free for the collecting by intrepid festivel goers. The Elsewhere site has a photo set of the posters in situ. Our contribution was a set of neon green stenciled “Stick Together” stickies, a hand-numbered edition of twenty. You can see one in the snapshot above of one of the site installation of the project, taken at the Design Museum, surrounded by contributions by other participants! Gluekit created this special edition “Babies Rock” onesie and “Acute Triangle” diaper tote for some very special friends this year. Hello Again from New Haven! Here’s our second postcard for the “Greetings from —–” exhibition that’s now up at Sunshine Studio Tokyo. This collage has as its base a sketch of the Louis Kahn Art Gallery at Yale, which we overlayed with some favorite Gluekit motifs to make our Greetings From New Haven (Pt. II). Our package with two postcards for the Sunshine Studio Tokyo’s “Greetings from ________” Postcard Exhibition, which opens in Tokyo this Saturday was sent out just hours ago (super quick delivery!). So many of our favorite artists are participating, and their efforts– chronicled on the PE blog— are wonderful to peruse. The exhibition opening is at SST this Saturday, September 6, 2008. We say Hello and Wish We Could Be There! Pictured above, one of our submissions: watercolor and cut paper on a postcard picturing Claes Oldenburg’s “Lipstick (Ascending) on Caterpillar Tracks” on Beinecke Plaza on the Yale Campus in New Haven, Connecticut.